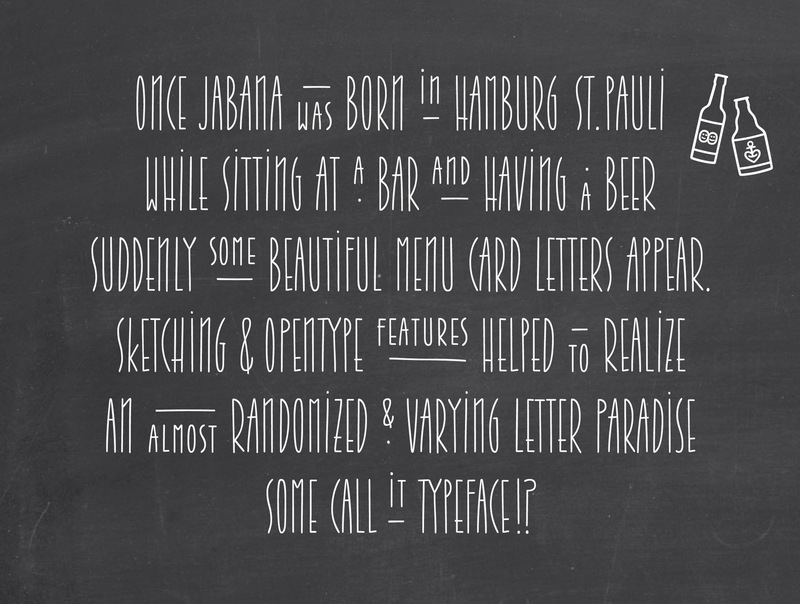 Inspired by having a ’Schorle’ in Hamburg coffee bars is not the full story of Jabana. Rather a beer or two will tell the truth about the first shapes and the OpenType madness with a total of 20 stylistic sets which are hardly known by users. The first shapes were spotted around Hamburg hipster area Sternschanze and Karoviertel. 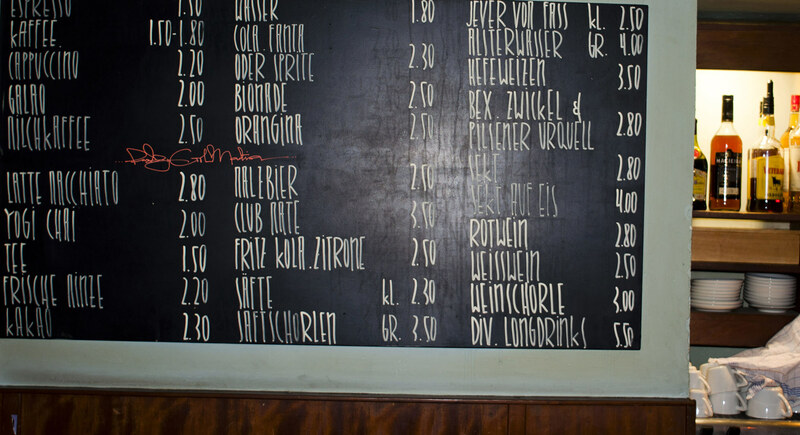 To announce their special drinks or cookies a lot of small cafe and bars use blackboards. We are not sure, but it seems that there is one person who draw all blackboards, or this specific style is copied by each and every bar. Before and after: At first the shapes needed to be analysed. So Nils took pictures of some significant shapes and inverted them. Surprisingly they look totally different in black on white. The feature we are most proud of is a combination of two features: At first the whole text needs to be formatted with the stylistic set 03. Then nothing will happen. But, now you are able to decorate your poem with the denominator or numerator feature: This will convert the caps to half-sized caps aligned to the baseline plus line above (dnom) or cap-height (numr) plus add an underline. Jabana comes along with a character set of more than 1500 glyphs. The main reason is the three variants of each letter shape. If you do not want to use the contextual feature you can directly choose stylistic set 01 or stylistic set 02 to get a less diversified text. But we suggest to switch on the feature for contextual alternates, as we describe within the next graphic. The contextual alternates feature exchanges the three different glyph variants, to make sure that no same letter shape will repeat to early. The glyphs are just slightly different, but this will give your text a fake handmade experience. Further, the 1/2 Jabana will remind you to use the fraction feature for more awesome details. The Jabana family is based on uppercase shapes. The small caps are half sized caps, which are slightly wider and accessible via the OpenType feature (short cut: cmd+shift+h). Moreover the quite short lowercase letters are shaped from the tall and condensed uppercase. So a lower w originates from a cropped upper W.
Stylistic Set 04 will change the correct double SS in your uppercase setting to the German sharp s (germandbls). Meanwhile the stylistic set 05 will remove the dot on all uppercase I glyphs. Stylistic set 06 changes your Arabic numerals from 1–39 to Roman numerals. Challenge: If some bring up a nice in use case including the Roman numerals, Nils will add 40–99, for sure! Stylistic set 07 is all about circled black figures. Possibly nice to emphasize and structure your project some more. Stylistic set 08 shifts some letter shapes to the centre of the cap height, because the lowercase are so tiny. This helps the uppercase setting stay better, but also adds a nice extra to the small caps. Stylistic set 09 to 16 replaces the bullet with seven varying bullets. For example: circle, spiral, rectangle, dots, snake, triangle, diamond and star. Stylistic set 17 replaces the fancy N and the lowercase styled K with a more usual N and K. Better readability guaranteed. And if you prefer so, you should check the Jabana Alt family with much more balanced shapes for better reading. 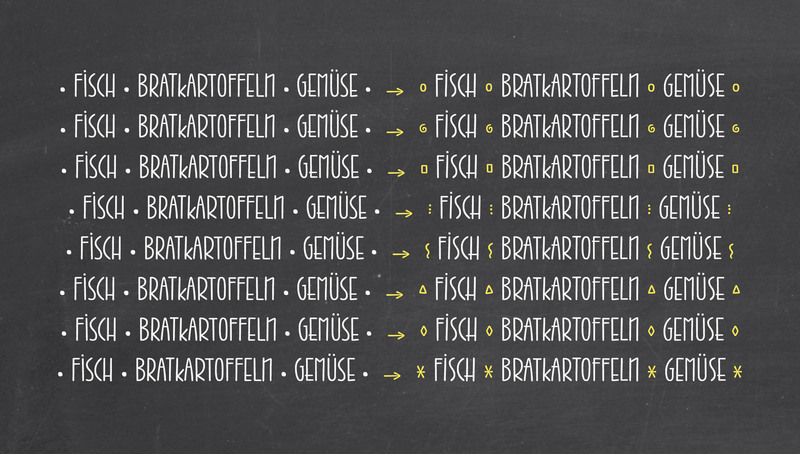 Stylistic set 18 and 19 replace the standard arrows by stretched and even a more stylish alternates.